Considering the profession of a registered nurse? Well, that’s a great decision. This career provides you with numerous opportunities to make a difference in the lives of people and serve society. For RNs, the growth prospects are unlimited. After becoming an RN, you can choose to work in any health setting. This occupation also offers mental satisfaction as you assist individuals in fostering something they treasure more than anything i.e., their health. A registered nurse is a professional, who possesses a large base of knowledge to prevent diseases, promote well-being, and aids patients so as to improve their health. They are highly valued and respected members of the health care team. RNs provide direct care to the patients by recording and analyzing their condition, keeping a track of their medical record, discussing treatment with physicians and the families. The medieval time was the intuitive era of nursing. During this period, nuns used to carry out the work of nurses, by looking after Christian warriors. Apart from religious duties, they were also liable to fulfill the orders from medical practitioners. The credit of bringing the most important turnaround in the nursing field goes to Florence Nightingale. She was the one who established nursing education. She explained the roles, duties and responsibilities of an RN in her book “Notes on Nursing”. She also penned a nursing theory, called “The Environmental Theory in Nursing”. During the Crimean War, she worked as a nurse in her early years, and lent significant assistance in improving the conditions of hospital. The nursing industry got highly influenced by her contributions and even today most of the nursing institutes necessitate the students to stand and declaim the “Nightingale Pledge”. The first formal registration of nurses was founded in 1901 by New Zealand through their Nurses Registration Act. The first RN in the world was Ellen Dougherty. North Carolina in the US became the first state to clinch the nursing licensure law in 1903. Registered nursing has experienced several drastic changes ever since it began, and it is still evolving. This field is dynamic and innovative; hence it expands constantly for the amelioration of nursing practices. Before you decide to take the plunge in RN profession, familiarize yourself about all the alternatives that are available. There are different types of registered nurses, and you will have to choose a particular career in this field. These nurses handle cancer patients. They provide assistance during chemotherapy and other treatments. To become an oncology nurse, you are required to do a comprehensive study on different types of tumors, malignancies and cancers. These nurses draw blood from patients for lab tests and other procedures. They also closely monitor intravenous procedures like dialysis and IV fluids. You can either acquire on-the-job program in phlebotomy, or go for a recognized phlebotomy course to augment your marketability in today’s competitive nursing market. Critical care nurses deal with critically and acutely ill patients. Also known as ICU (Intensive Care Unit) nurses, these professionals ensure that the patients in serious conditions or those suffering from a chronic degenerative ailment receive the utmost care. To work as a critical care nurse, you’ll have to obtain a certification from “American Association of Critical Care Nurses”. You may certify in cardiac surgery, cardiac medicine or progressive care. Fertility nurses, also called as in-vitro fertilization nurses, provide necessary care all through the early stages of pregnancy, and assist doctors in the process of embryo transfer, oocyte retrieval and ovarian stimulation. A certification in endocrinology/infertility nursing is essential to become a fertility nurse. Emergency nurses provide intensive care to the patients in critical phase of their injury or illness and emergency. They mostly work in hospital emergency departments. They need to obtain additional certifications in the field of injury prevention, trauma, geriatrics and pediatrics. Labor and delivery nurses help women before, after and during parturition. They help surgeons during cesarean deliveries, monitor both child and mother, and instruct new mothers about postpartum health issues and newborn care. Neonatal nurses are the nurses who provide specialized care for healthy as well as premature and ill newborn infants. They are a central part of the neonatal care team. The perioperative nurse, also known as an operating room nurse, looks after the patients before, after and during the surgery. They work closely with nurse practitioners, nurse anesthetists, surgeons and surgical technologists. These professionals help in health assessments, vascular monitoring, cardiac monitoring and stress test evaluations. These nurses possess Advanced Cardiac Life Support and Basic Life Support certification. APRNs are those who not only acquire basic nursing education and licensure, but also Master’s degree in the same field. They provide direct care to the patients. There are various types of APRNs. For more details, read article on Advanced Practice Registered Nurses. RNs can work in different types of healthcare settings such as community centers, government hospitals, nursing care facilities, home health care companies, local medical hospitals and physicians’ offices. As a registered nurse, you spend most of the time standing, stretching, bending and walking, and also come in contact with people suffering from infectious ailments. Overall, the job of an RN is strenuous but gratifying. How to become an RN? If you are an aspiring RN, you need to go through the below given 3-step process. Get program from a state-recognized institute is the first step. There are several institutes that offer program to the aspirants, in order to fulfill the increasing demand of the healthcare industry. Bachelor’s degree in nursing, associate’s degree in nursing and diploma- you can opt one of these three options. To know the detailed requirements for getting admission and finding state-accredited institutes in your state, read our “RN Schools” section. After completing the program; you need to take up the NCLEX-RN (National Council Licensure Examination) for obtaining the license. At present, this exam is conducted by Pearson VUE, and is taken in the form of CAT (Computerized Adaptive Testing). The test checks your knowledge and eligibility to assume the role of a nurse in the real work settings. 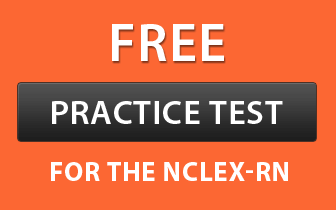 Practice test helps you overcome your weak points and increases your chances to clear the NCLEX-RN in one attempt. Go through our “Registered Nurse Exams” section to get in-depth information about the format, duration and tips to crack these examinations. The final step is to acquire your RN certification. The Board of Nursing of every state requires the candidates to possess an RN licensure so as to ensure public safety. You’ll get a certificate only if you qualify both the written and practical exams. Without certification, you can’t carry out your work. Once you obtain the license, you need to renew it after every 2 years. What are the requirements to get your license renewed in your state? Check out our “RN Certification” section. How much does a registered nurse earn? In May 2017, according to the BLS, the mean pay for RNs was estimated to be around $73,550 per year. The mean hourly wages for these professionals were $35.36. The top paying states for this occupation in the United States were- California, Hawaii, Massachusetts, Alaska and Oregon. As per indeed.com, registered nurses earned $67,017 annually (as of May 2017). What factors affect the salary? How much can you earn in your state? Explore our “Registered Nurse Salary” section. Technological advancements, rise in the number of aged people with functional disabilities and high turnover rate of nurses are some of the factors that have increased the demand of RNs in the job market. Today, the number of vacancies is more than the number of qualified candidates. In the impending years, huge demand for nurses has been anticipated in remote cities and rural areas. The Bureau of Labor Statistics has projected 19% growth in the employment of these professionals from 2012 to 2022. Nursing is a recession-free profession. Still, it’s evolving and is believed to grow even more. As explained earlier, the employment is going to expand by 19% from 2012 to 2022, which means prospective students will have immense opportunities to excel. You can opt from any of the job areas- industrial nurse, occupational health, public health, home health, nursing homes, hospitals, and teaching positions at universities and colleges, etc. You can also choose your working schedule and working area. You can work on weekends or weekdays or both, as per your convenience. You also have the flexibility to work in 4, 8, 10 or 12 hours shift, whatever time of day you prefer. Moreover, you can practice your profession in any state of the USA. Registered nursing is one of the careers that provide you an opportunity to serve others, and make an impact on the patients and their families. Your contribution towards the welfare of the society will make you feel contented. In addition to salary, RNs enjoy several other fringe benefits like sick leave, paid holidays, dental and vision insurance, health and retirement benefits. Know more here.. Occupation Therapy is a field of nursing which prepares you to deal with people suffering from cognitive, mental, or physical disorder. You must have complete information about the coursework, duration, and advice on top schools of Occupational Therapy, before choosing Occupational Therapy as your career.